A while back I made a cardigan for myself, and at the time the Cosy Cardi Challenge was going on on Instagram (I’m @sewsmartuk if you want to follow me there). As such, I decided to enter, and a couple of weeks later it transpired that I won one of the prizes. 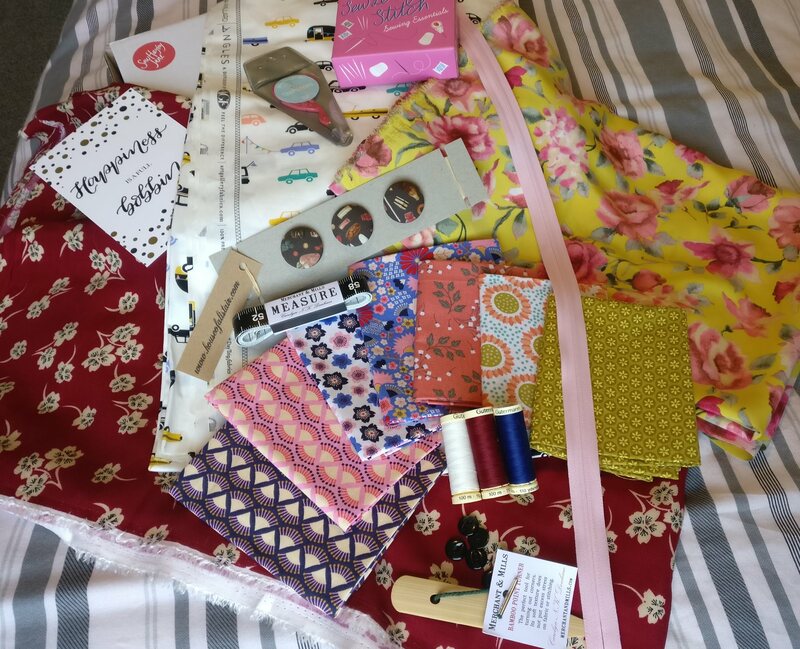 I won a super Stash Box from SewHayleyJane. Just to be clear, I don’t think this is one of Hayley’s usual monthly boxes, so I wouldn’t take my stash to be what you’d receive each month; I think this is more of a pick & mix. To be honest, I wasn’t sure what to expect, but suffice to say that when the parcel was opened, I was so happy. Just have a look at the goodies. First out of the box is a selection of 7 fat quarters. These are all lovely fabrics and I can see them getting used as pocket linings and other details such as under-collars in future makes. There were also some notions; a set of lovely black buttons which will be useful, some Gutermann threads, a pink invisible zip (not measured, but 55 cm maybe?) and some gorgeous chocolate brown fabric-covered buttons with sweets on the fabric from House of Alistair. In addition there are some sewing tools which will all see much use; a tape measure and point turner from Merchant and Mills and some gorgeous Snipsters embroidery scissors with their own case. I was really excited to see these because I travel occasionally for work and I like to take some sewing or knitting with me. These are so sharp and because they come in a case, I can happily put them into my suitcase without worrying that I’m going to end up with an unintended hole in something! In addition, the sewing essentials kit will also end up in my suitcase. You wouldn’t believe the number of times I’ve sat in a hotel room hand sewing a hem back on to a RTW garment. Finally it’s on to the main show – the three (yes three!) gorgeous pieces of fabric that were included in the box. First up it’s 1m of this silky-soft, incredibly drapey peachskin. I’ve never sewn with peachskin, but I am looking forward to the challenge – especially as I have some spray-starch in my sewing kit. My daughter has already claimed this for a dress. The next piece is this glorious Art Gallery fabric. Hayley generously included 2.5m of this buttery cotton. Needless to say that because it has vehicles on it, my son has already claimed it for a pair of pyjamas. He’s still young though so there should be plenty left for me to make something for myself. The final piece is MINE! This is love at first sight, people. This fabric is just so soft, so warm and yet cool against the skin, so floaty and yet heavy enough, and just look at that colour! I cannot describe how much I have fallen in love with it. It’s viscose twill and I love it so much I’m very tempted to buy some more. I really wish I wore floaty dresses because if I did this would be perfect to make up into one, but I don’t, and much as I’d love to make one with this, I know if I did I’d never wear it, and that really would make me cry. Instead, I have my eye on some really posh pyjamas. I have a vintage pattern from my Aunt that I’ve wanted to make up for so long. I think they look so glamorous and I can really imagine swishing around the house in them in this fabulous fabric. Just found your blog . You are my type of sewer/sewist …. I love sewing but I am definitely not an expert,. I didn’t get round to making a card I for the challenge this year.. I will look out for the pattern you used.